Hoping a professional can fix this! I'm usually pretty good at keeping my car clean, but I've been unwell lately (I have glandular) and with the hot weather etc my car has been neglected. I've just given it a quick was today between downpours and noticed that I have two marks on my roof from what appears tree sap/bird/bat to the point where it appears the clear coat has cracked (it's not just etched! ). I assume that if this is repairable, it's not a DIY thing and that a wetsand etc is required. Even if it is DIY, it's not something Im keen to try and fix on my own. I'm in the Camberwell area, Melbourne. Anyone aware of any good detailers nearby that I can get an idea of whether it's repairable? Or is Final Inspection my best bet? Re: Hoping a professional can fix this! Looks like it's just in the clear coat. Does it feel rough under the finger? 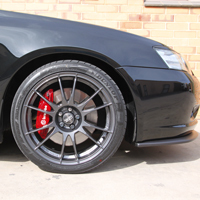 My approach would be to clean the area with a clay bar, then get some ScratchX onto it. If that doesn't work, then it's more serious and I'd be seeking a professional. HyRax wrote: Looks like it's just in the clear coat. Does it feel rough under the finger? It's certainly rough under the finger sadly, so I'd say it's going to need more than scratchx. I wisely/unwisely gave it a light clay, paint cleaner, wax yesterday to protect it a bit until I work out what I'm going to do. My car has a couple of those from the prev owner so I'm very interested in DIY and or pro fixes. Can't say for sure without seeing it in person, but you'll probably need a respray to fix it properly. Small chance you could get away with wetsanding it but since you can feel it with your fingers the damage is definitely pretty extensive unfortunately. I'm thinking clay and prepsol it, then use a toothpick and several hours to dot clearcoat in the damaged areas, let dry, then once its cured give it wet n dry, then polish. ScratchX is useless, i wouldnt bother with that. Best chance as a DIY would be a 500 grit compound and a dual action polisher. Anything that wont get out is a definite wet sand which you wouldnt do yourself. I have a few bird sh*t marks on mine from the previous owner and the dual action couldnt get mine out.. but it definitely reduced them. I have the same thing on a small area of the roof. 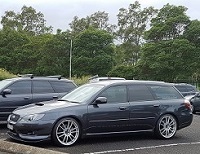 Also happened on my old liberty on the rear spoiler (wagon). I got a mobile professional to fix it back up and re-spray. Turned out pretty well, couldn't tell the difference. He did re-spray the whole spoiler though so not sure if it can be done to a small section or not. Bezzza wrote: I got a mobile professional to fix it back up and re-spray. I can concur with mobile guys. I've previously used 1800-Bumper in Sydney a few times before for small spot repairs in the middle of panels and they do magic work. Will assess my professional options. Will advise back. I have exactly the same thing right in the middle of the bonnet but between the cracks you can see white, I hoping its just bird pooh and not an under coat/primer. I have a park outside my house all week and don't have to pay so i ride my bike the few k's to work, after a week without using the car at all and not cleaning it since I got it 5 weeks ago I took it through a car wash and after a closer inspection noticed the same thing very annoying I can't afford a full bonnet respray.